At the end of October we decided to make a short road trip just before heading back to work. Around that time of year, the best chances of nice sunny and warmer days are to be found in the south of Europe. Picking a place was difficult, but flight ticket prices helped us choosing … The cheapest tickets we found would bring us from Ostend to Barcelona, for only 150 euros (two people, return tickets). 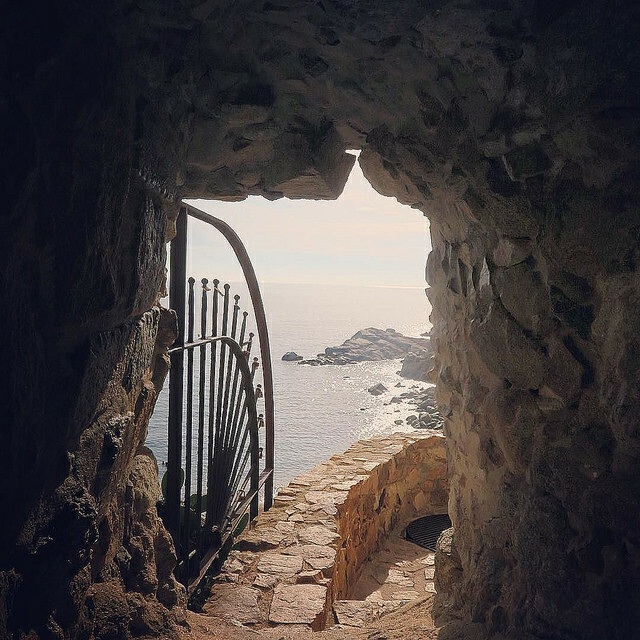 Although we’ve been to Barcelona at the beginning of the year (see previous post trip January), it also is the perfect base to start a trip around the Costa Brava. Now, we would never go to the Costa Brava (or for that matter, any Costa) during summer. 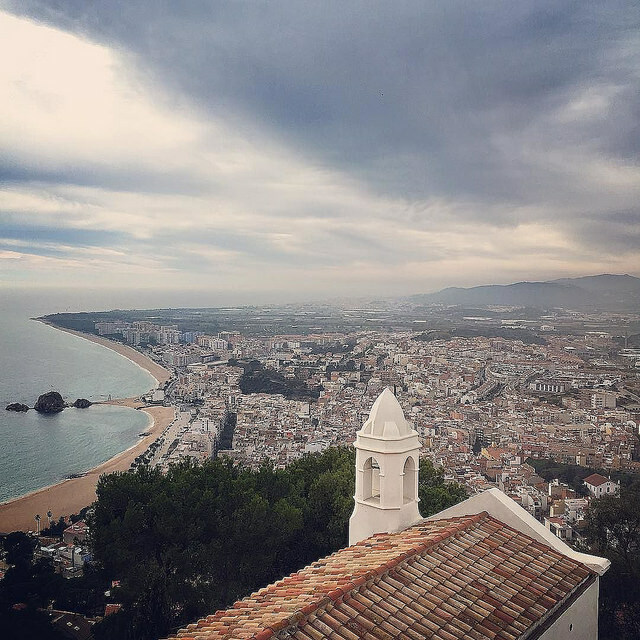 Most of the places are packed with tourists, and have a reputation … But outside this period, you can discover some really nice spots, nearly without any tourist (once outside of Barcelona) and on top of that, hotel rates are surprisingly cheap! We started our trip in Barcelona. There still was enough to discover! We arrived around 8am at the airport, almost missed the one bag we’d checked in, and could leave our luggage at the hotel meaning we could start our day already around 9am! 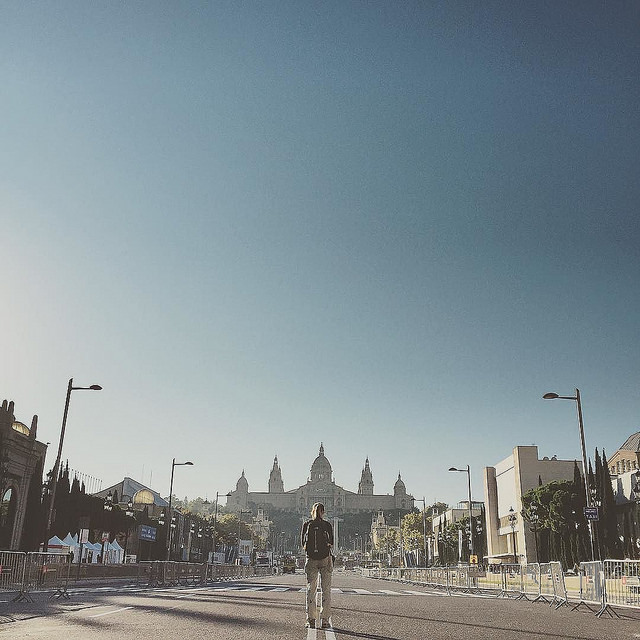 Mind we were awake since 3am … Plaça de Catalunya is the first big square when you come into town from the airport using the airport shuttle bus (this is the fastest way to get to the centre, at an affordable rate of € 10,20 return – you can also buy your ticket online). At the Square, you find a shopping centre. Nothing unusual in a big city, but here you can go to the roof for a lovely view over the square and Palau Nacional. Tip: use the shopping centre entrance, not the elevator outside (although the transparent cage takes you up at a nice pace which makes for a nice timelapse, but it will cost you € 1). We walked along the avenue towards Palau Nacional. At night you can enjoy a light spectacle called the Magical Fountains. The fountains are truly amazing, also at day light! The palace is huge and defines every view around this place. The National Art Museum is located inside the palace, which was build for the World Exhibition of 1929. From the stairs one can enjoy magnificent views over town. Palau Nacional is build on Montjuïc , where you can also find the Olympic Stadion – first build for the Games of 1936, not used because of the civil war, but later used for the Games of 1992 and now home of soccer team Espanyol; Palau Sant Jordi which is a weird and very modernist construction and nowadays a basketball stadion, some museums (Miró to name one of the most famous artists) and the castle on top of the mountain. We cannot deny we love Barcelona. It has about everything we like about a city: lots of green spaces and parks, the beach and the harbour, the lovely old streets where one could easily get lost. After a nice meal, we got back to the hotel and prepared ourselves for the rest of the trip. The remains of the old town (Villa Vella) and a Roman settlement (dating back to the 1st to 5th Century) are well conserved. The hike to the top of the hill offers beautiful vistas over the coastline and the town, although the lighthouse is not really a highlight. The cactuses however are huge! This little gem was a very nice discovery (but do remember: we came outside the tourist season).